Mix dry ingredients: flour, baking soda, salt, etc. in a bowl. In a large bowl, add raw honey, pumpkin, and oil; mix together. Add the mashed banana and vanilla and mix thoroughly. Add the flour mixture a little at a time and stir to mix. Fill muffin pans. Bake for 25 minutes, or until a toothpick inserted into the center comes out clean. 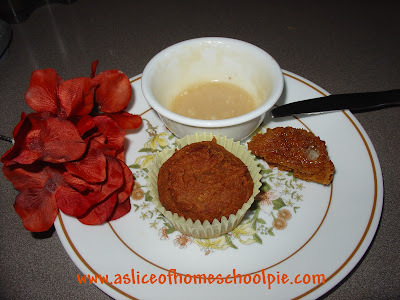 If you bake the pumpkin pie muffins, please leave me a comment letting me know how you and your family enjoyed them. Warning: they don't last long in one's household. Note: You can also use this recipe to make pumpkin bread. To do so, decrease the amount of pumpkin to only 2 cups. Bake for 50 minutes. Serves: 8. This looks so good! Gotta be sure to try it! I think I might show up for breakfast! yummo! I am following the blog hop and subscribed via GFC as masugr. Hope you can stop by http://mywildcrazylife.blogspot.com and follow me as well! I just made these tonight and let me tell you, they are absolutely FANTASTIC! Thanks for sharing! your ingredients say baking powder, but under the photo's it says baking soda. which is it?